Her final letter came in January 1942. The Wannsee Conference of 20th January 1942, the aim of which was to co-ordinate the steps to be taken for the Final Solution, suddenly changed the prisoners' situation. "In Ravensbrück, Olga was the block eldest in the Jewish block... she freely confessed to being Jewish, and the Jewish women in Block 11, the 'pure' Jewish block, were much in need of Olga." All the Jewish women were taken in various transports from Ravensbrück to Bernburg (Bernburg is near Dessau). In Bernburg carbon monoxide was used in the gas chambers. It is a colour less and odourless, lethal gas. On inhalation, it combines with haemoglobin and prevents the absorption of oxygen. A small amount, breathed-in, leads to suffocation. From 1940-1941, part of the former state sanatorium and nursing home in Bemburg was one of the six "Euthanasia" centres of the Third Reich, where altogether 70.000 sick and handicapped people were murdered with gas... The NS-"Euthanasia"-crime began in Bernburg in autumn 1940. 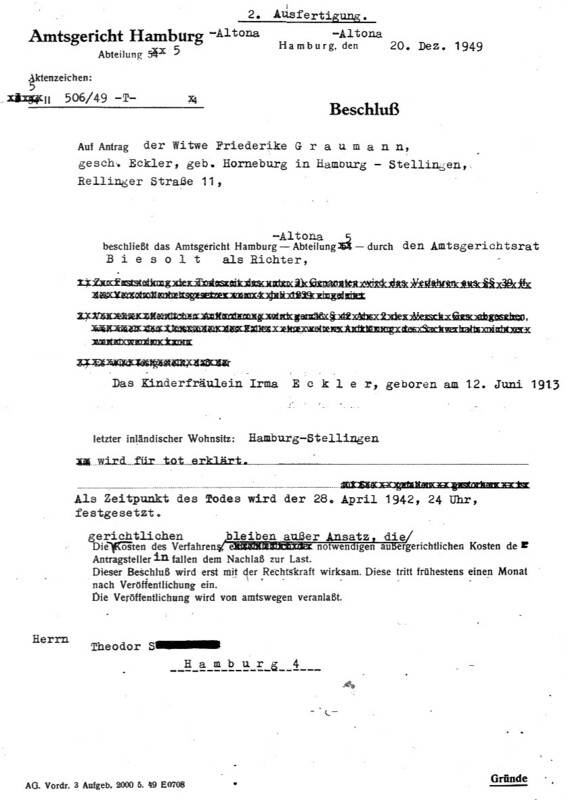 In October 1940 an advance detachment arrived from the "Euthanasia"-Clinic Brandenburg. The former men's wing was converted a gas chamber disguised as a shower room, a post-mortem room and a crematorium were the prerequisites for the murder of thousands of people. It was a perfect extermination plant. The victims did not stay long - they were killed on the day of arrival. As of August 1941 killing of the sick and handicapped was decentralized, and throughout the Reich in nearly one hundred psychiatric clinics the deaths continued by means of medicinal over-dose and/or the gradual with-drawal of food. At the same time, in three of the "Euthanasia" clinics, another mass murder took place. Under the so-calIed "Special Treatment 14 f 13", racially per- secuted prisoners, and those no longer able to work were killed in the gas chambers. In Bernburg alone, by March 1943 about 5,000 prisoners - almost all Jewish - from Buchenwald, Flossenbürg, Groß-Rosen, Neuengamme, Ravensbrück and Sachsenhausen concentration camps had been killed. 5 Gas champer. 60 to 75 people were locked into an area of 13 m2. They died a harrowing death. After 1945, the grandmother tried to get a death certificate for her daughter. She knew that Irma had been arrested in the summer of 1938, but nothing about her detention in the Fuhlsbüttel, Oranienburg and Lichtenburg camps. 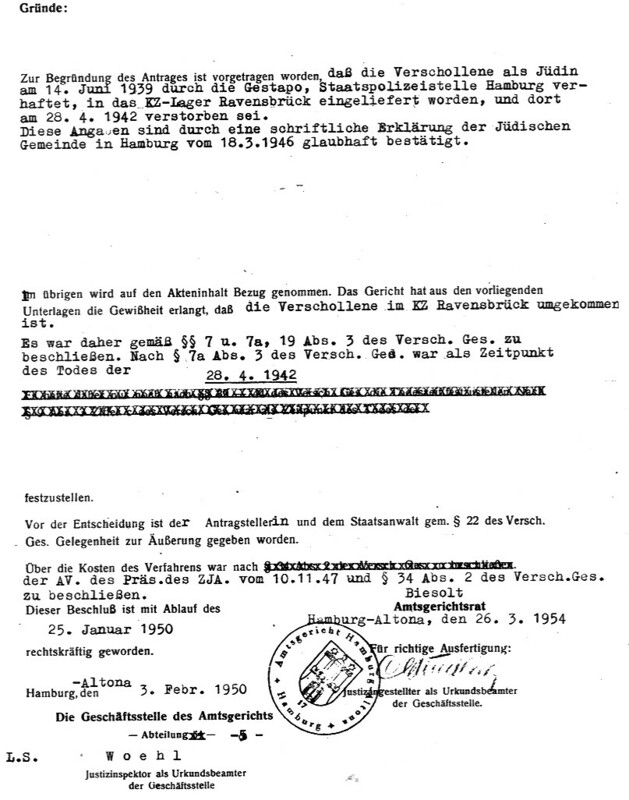 Was it presumed that she was deported on 14th June 1939 because Ravensbrück was not occupied as a camp until 15th May 1939? Research has shown that she was arrested on 18th July 1938. 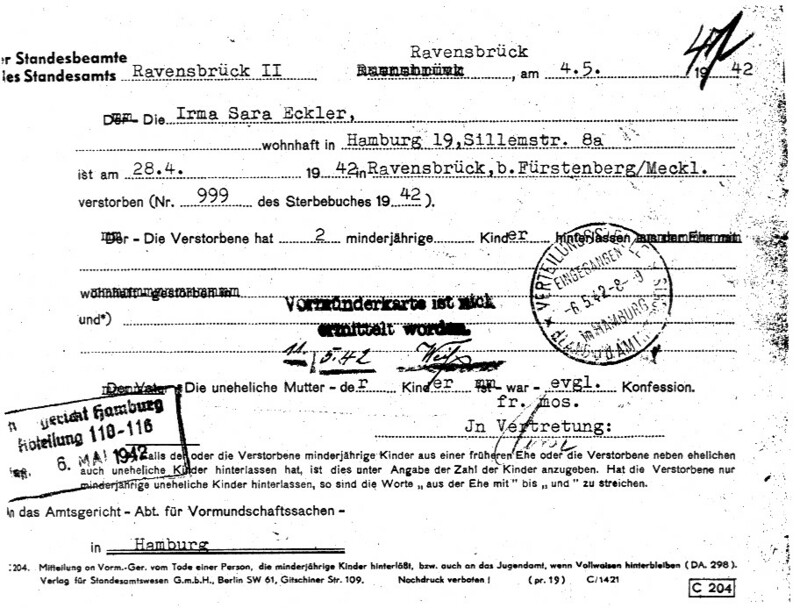 Also, Irma Eckler did not "die" on 28th April 1942 in Ravensbrück, but, according to what we know, was murdered with the help of gas in Bernburg. To torment, humiliate and kill innocent people in this most brutal way will always remain incomprehensible.